Aloha and Best Wishes for a Joyous, Healthy and Productive New Year to all our members and supporters! We are pleased to share with you here our review of 2010’s challenges, accomplishments and activities. The photo to the right was taken at the Wai ‘Opae Marine Life Conservation District, also known as the Vacationland tide pools, which we helped to protect several years ago. The underwater shot was taken by Scott Henderson during a study that we commissionto measure water quality and fish populations (native and non-native) over time. It is an important tool in our ongoing program to monitor and preserve our aina. As you know, our exempt purpose as a 501(c)(3) nonprofit is to assure critical habitat for native species and open spaces for future generations through environmental education, hands-on projects, and acquisition of real property for preservation, protection and restoration. Please keep this in mind as you read this newsletter, so that you can judge for yourself how well we are succeeding in keeping this commitment. We held two expos in 2010: in May at the beautiful Kamehameha Schools campus, and in October at the Leilani Estates facility. From now on we will only put on one expo a year, and it will be held in Leilani. Next one will be October 8, 2011. 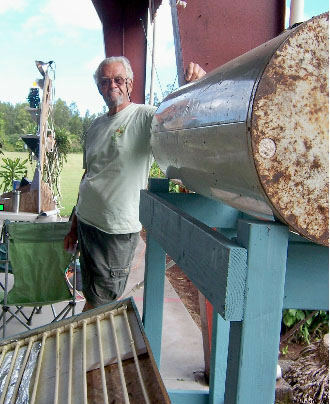 Shown to the left is Jon Olson with his home-made solar hot water heater. Tom Lackey showed up with a still whose product can run your lawnmower or spike your punch. Our expos are designed to allow Puna residents who have information, resources, products and out-of-the-box affordable do-it-yourself ideas to share them with the rest of us. And, of course, to give the rest of us the opportunity to learn, buy, share and promote right back at them. Barkus Adams, who is in charge of the environmental programs and projects at Kalani Honua, not only volunteered at our October expo (above) but invited us to take part in two events at Kalani this year. On July 4th we set up an exhibit and handed out some of our materials, and talked story with attendees. Then at their Eco-Fest on Oct. 25th, René gave a talk on “Sustainable Home Gardens” and Nohealani spoke on “Native Plants’ on Oct. 29th. Both were well attended and well received. Strawberry Guava Control Myth Busters! 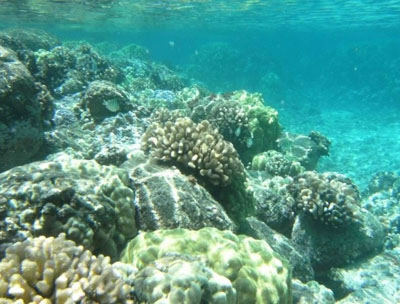 As a result of a grant proposal written by our Education Chair, Malia Messick, we were awarded a $77k grant from National Oceanic and Atmospheric Administration (NOAA) for a program for grades 2-4 and 11-12 at five different schools in Hilo and Puna makai. The program, Keiki Advancing Hawai’i’s Understanding of Watershed/Ahupua’a Issues (KAHU WAI) combines the natural sciences with Hawaiian culture. A Kahu Wai was a steward of the freshwater resources, so this is an appropriate (and very clever) acronym. Malia has collected a group of experts to create a curriculum, which can be used long after the grant period. The textbook is packed with full color photographs donated by some of our State’s best known photographers. The research projects that the students create will be showcased at the end of the project in both Hilo and Pāhoa. We are not always the ones doing the educating – sometimes we need to be educated ourselves, so that we can pass updated scientific information on to the rest of you. So on July 15th, René attended a seminar about Guava Rust – also known as ‘Ohi’a Rust. There is a lot of research being done on this in Brazil, where it originated, and biologists are now able to track it genetically because it mutates readily and adjusts to the biology of the host plant. Individual plants that have a natural resistance are being studied to see if that resistance can be passed on. If so, this would be a good tool in our arsenal to protect our beloved ‘Ohi’a trees. Since it was an election year, we held two Candidate Forums, in response to public requests: for Council District 5 and State House District 4. Both were well attended. We asked our environmental questions first and then opened the floor to the audience. At the mayor’s request we agreed to take part in a forum about our mangrove project. Ann, René and Nohealani countered Syd Singer before a full house of interested residents. Some of our Board members, led by our intrepid Vice-President Ann Kobsa, have continued trekking through the Nanawale Forest Reserve this past year eradicating miconia plants. On occasion they also kill other weeds. Ann has also been outplanting rare natives grown from seeds collected in that forest. Starting in 1999, when we hauled off 2.92 tons of driftnet from the Vacationland tide pools (in conjunction with DLNR and community volunteers) we have been actively concerned for this beautiful ecosystem and began working to designate the area as a Marine Life Conservation District (MLCD). This goal was achieved in 2003, but just naming the tide pools as conservation without maintaining the habitat defeats the purpose. So when we noted encroachment of Red Mangrove rapidly taking over, we took action. Contrary to the claims of some, we spread the word widely about the problem, our plans to address it, and called for volunteers. In 2005 we began to hand clear the mangrove keiki, but by 2006 we realized that it was a losing battle unless we could intensify our efforts; so we started looking for grants to fund an expanded project. In 2008, with grants from the Hawaii Tourism Authority and US Fish & Wildlife we were able to purchase supplies and hire residents to work on the project. We worked out a protocol that was the most resource-responsible and effective with the least environmental impact. By 2009, we expanded the scope to include all mangrove populations on the island, so that the completed areas would not be continually re-infested and our island’s coastline would be saved from further detrimental effects of the mangroves. Our efforts have recently been hampered by a lawsuit (and a massive misinformation campaign), but of the four counts the judge has already ruled in our favor on two of them. We expect favorable rulings on the last two. Meanwhile, the project is almost completed despite those who said it couldn’t be done, and we have also done considerable restoration work, planting thousands of native coastal plants to replace the mangroves. Sara Miller of the Pāhoa Village Museum conceived this project, which is converting vacant lots and eyesores into gardens. One problem she encountered was that property owners were concerned about liability. We have put the project on our liability policy, so that that concern has been addressed. We are also supporting her efforts by donating a few plants and sending our community service workers to help with this beautification project. The Ag Dept. maintains a list of noxious weeds, but those plants that have proven themselves to be the most noxious are no longer on the list. Examples are strawberry guava and albizia. The reason? The way the department’s rules are written, the criteria for listing includes four definitions of invasiveness, but also a fifth definition which limits the list to only those plants with a limited geographical distribution for the purposes of eligibility of a landowner to take part in a cooperative program with DOA. This wording creates the misleading impression that if a plant is not on the list it is not invasive. And then people make decisions based on this misinterpretation. We have drafted a change to the way the rules are written, which would allow any plant meeting the basic criteria for invasiveness to remain on (or be returned to) the list; and only those plants that also meet the “too widespread for DOA to invest in” criterion will be eligible for the cooperative agreements. Rep. Faye Hanohano submitted this request for a change in the wording of the rules, at our request, to the Board of Agriculture, and we are awaiting a response. If granted, this could lay the foundation for community groups to gain landowner permissions and outside (i.e., non-DOA) funding for control projects. The Hawaiian monk seal is endangered, with a population of well under 1,300 individuals. Threats to their survival include sharks, depletion of their preferred food source (lobster), and human activities including hunting, drift nets and the long line fishery. We are part of a coalition of environmental, community and stakeholder organizations that have been lobbying the State and Federal governments for increased protections, increased penalties for violations, and increased educational efforts. For many years now, we have been acting as fiscal agent for many local ad hoc groups and projects. This year it was for the Pāhoa Youth Jamm in March and the Pāhoa Village Museum grant proposal for a community project. We have assisted the community policing division of HPD, the Pāhoa Weed and Seed site coordinator and the Pāhoa Village Museum by teaching them how to apply for and write their own grants. We have passed along information about grant availability to Pāhoa Feed & Fertilizer and Pāhoa Arts And Library Assn. (PAALA). And we have assisted Puna Community Medical Center in finding and applying for grants to keep the clinic open and providing treatment for all. Federal law requires us to provide you with our fiscal information upon request. Our bylaws require us to approve the Annual Treasurer’s Report and the Budget for the upcoming year at our first Board of Directors meeting, held on the second Wednesday of January. Thus, although fiscal information for previous years can be accessed by you at any time, the current budget and report will not be available until Board approved. To request this information, just email us with “fiscal report request” in the subject line and we will be happy to send it to you. Because we are a publicly funded nonprofit, you have a right to know.